Last Friday, June 15, 2001, my father, Clavis Wilson Murley, passed from his life on this earth at 5:42 in the morning. I was resting in a roadside park in Eagle Colorado when the phone rang and the voice of the minister of his church in Corning, Arkansas informed me of his demise. Although I knew he was in bad health, and was expecting him to pass, still, I felt a deep sorrow and for much of that day tears would fill my eyes at any given moment. As we crossed back over the Rockies that morning not even the vision and splendor of the peaks and trees clothed in white glistening from a mid-June snowstorm the day before could lift the pain from my heart. 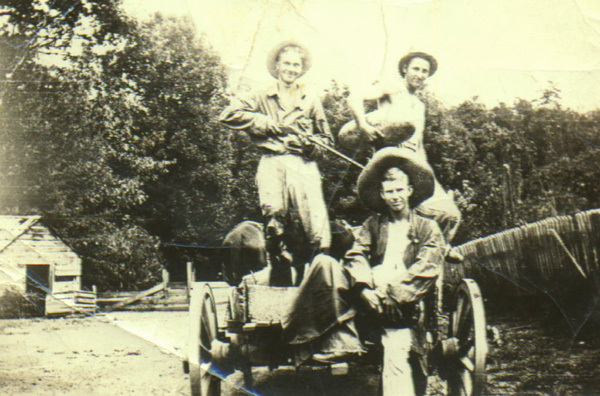 I spent all that day and that night driving the eleven hundred miles to Corning, Arkansas where he and my mother lived. Upon arrival early Saturday morn, very tired, I found Mom and her sister Jean Rowlett and my cousin Gary Rowlett sitting around the breakfast table. My sorrow went to her, realizing that she was alone for the very first time in her life. She and dad had been married 65 years and a little over 5 months. Through out the day and indeed for the next two days, streams of relatives and friends of theirs from the community and their church bearing words of consolation and platters and plates of food until there was no place to store them. On Sunday the 17th of June, as is the custom where I grew up a viewing, previous to the funeral is held. Many friends of the family and relatives from out of town attended. There were even people that I had attended elementary school with as a small boy. 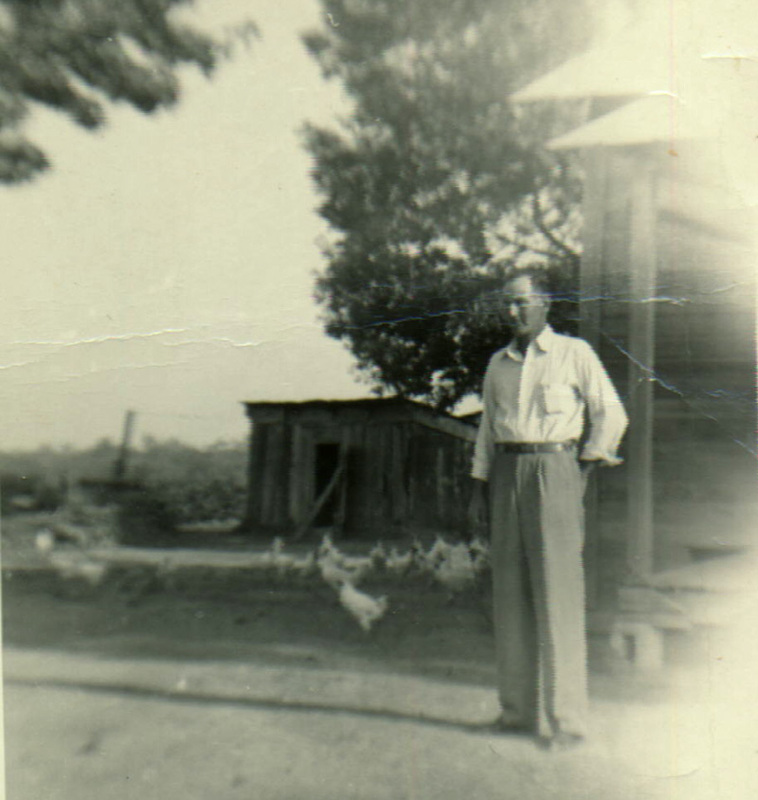 Clavis Murley on his farm between Corning and McDougal, Arkansas ca. 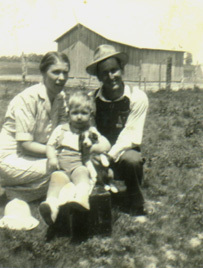 1950-52 My father was a gentle man, I remember him for his efforts in taking care of our family. If there was work in the fields, or chores at home to be done, he would not rest until it was accomplished. All of the time when I was at home he was a farmer growing cotton corn and soybeans. I think he was a good farmer, our crops were always equal to any in the community. He would set on that old John Deere tractor, and plow the small cotton almost cleaning it sometimes until it was almost unnecessary to hoe it. I don’t believe he ever taught me an untrue principal in my life, nor did he ever set a bad example. He didn’t drink, he never spoke bad of anyone, he never even said anything bad about a man named Jim Harmon that ambushed him in 1962, hitting him in the side of his head, breaking bones and doing considerable damage. I am not sure he ever quite recovered from that. His thinking and decision making always seemed to be a little clouded after that, at least to me. I was in Viet-Nam when this occurred, when I got home all that I could think about was doing Jim Harmon bodily harm. But I was made to promise that I would stay away, Dad was not a vengeful person either. Although I have been away from home for many years, and not as close as I should have been, I will always treasure the days of hunting rabbits and squirrels, and just walking the woods and fields, and talking with him. I always enjoyed his company, and I will miss him. It is a common fault of us all that we put our lives and fortunes above and foremost before those of our parents and oft times wait until it is too late before saying all the things that you would like to say to them. Please don’t! Just to say to them "Thanks Mom and Dad, you were and are good parents”. That means a lot, or I know it would to me. On June 18th, 2001, Clavis Wilson Murley was laid to rest on a beautiful, sunny spring morning at the Mitchell Cemetary in Greenway, Clay County, Arkansas. Know you All, that a truly good man has left us.